Many historians feel that Dwight D. Eisenhower was the last great US President. An extraordinary military leader and strategist, he served two low-profile terms during which he established the lasting US policy on the mid-east, fathered the US inter-state highway system, expanded Social Security, and integrated the military services and southern universities, among other accomplishments. Fiercely independent and self-reliant, Eisenhower is credited with originating the Eisenhower Matrix, a time management process that served him well. As a man of that caliber, it was important to plan his time and actions and focus on what's important. Leadership, time management and planning guru Dr Stephen R. Covey popularized it in his books "First Things First" and "The Seven Habits of Highly Effective People". You can use this method for your time planning as well, preferably as part of a weekly planning tool like Weekdone. 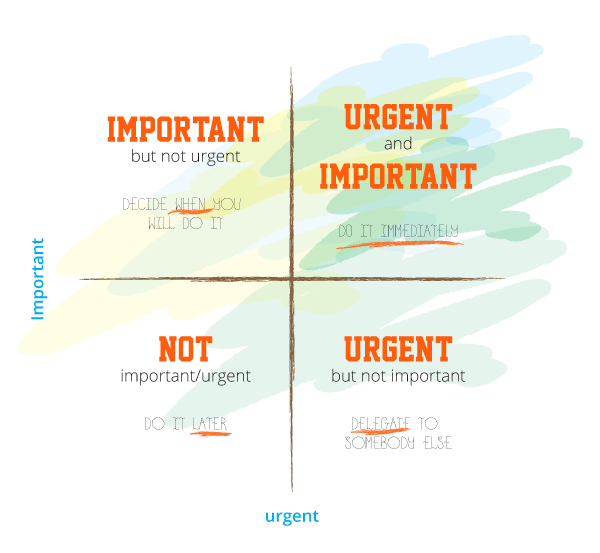 The Eisenhower matrix expedites time management when used daily. You list all the tasks for your day in one or another of the boxes. As you list them in the box, do so by priority. When finished, address the Urgent/Important Tasks immediately and dismiss the Not Urgent/Not Important tasks. If possible, delegate the items in the Urgent/Not Important box or leave them for the future, when there are no more important tasks. The Non Urgent/Important tasks should be assigned a completion date, but they should never take priority over Urgent/Important tasks. When using Weekdone for your weekly planning, as much as possible, try to enter the Urgent/Important plans first and focus on those. The second in importance are the Non Urgent /Important tasks, so each week also have a few of those. Divide items into those that you could not foresee and those you have left to the last minute. Plan to handle the unexpected or reschedule some other item. Debrief when complete to determine how you will respond next time. Items listed here stop you from getting your work done. Delegate them or reschedule them. Just say “NO!” or coach people to solve their own problems. Complete the items in Quadrant #3 to achieve your goals. Allow enough time to do these things right, or they will become Urgent. These items are distractions. Ignore them or drop them. Or, decline the request. Not everything that can be done must be done – or even planned. Simplify and declutter your todo list by throwing these straight into the dustbin. The key benefit to the Matrix is its elegance. It lends itself so easily to accessibility and function. The template is easy enough to draw and photocopy. In addition to the matrix, you could implement these top 10 easy to implement steps for a more productive week. Try the matrix together with Weekdone and see how it supports your focus on managing your personal and professional time. Download also our eBook to find time for work that really matters. Remember to follow us on Twitter, Google+ and Facebook for all about time management, status reporting, weekly planning and more! Posted by Weekdone team. We write about hassle-free weekly employee status reporting and other tricks to improve your team leadership.